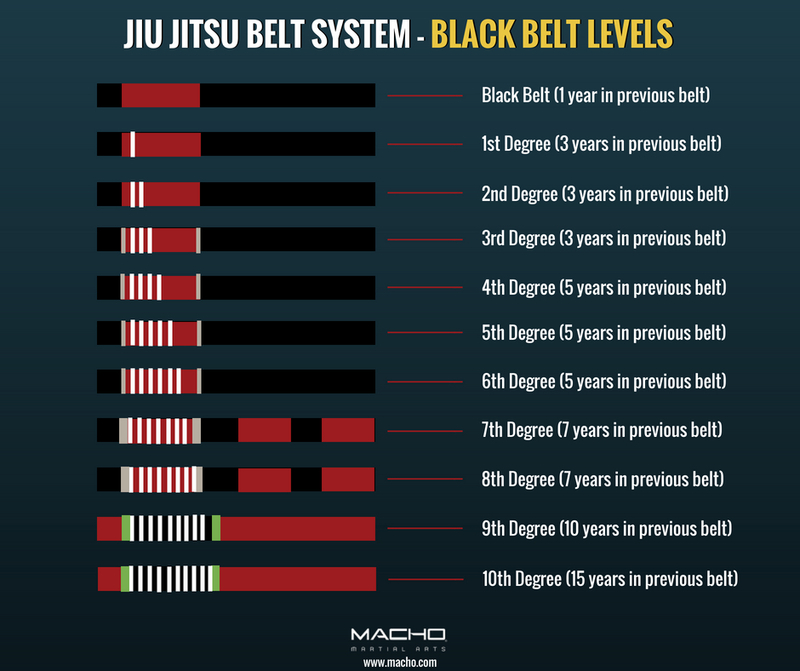 Brazilian Jiu Jitstu Belts & Stripes Explained - The Macho Blog. Different martial arts practices have different ways of promoting students’ ranks. Although the colored belts are most often associated with karate, they are also present in Judo, Brazlian Jiu Jitsu, and Taekwondo (to name a few). In this post, we are going to dive into how BJJ belt rankings work, as there are two different belt ranking systems in place for children and adults. All information has been provided by the SJJIF, Sport Jiu-Jitsu International Federation, which is the international governing body for Brazilian Jiu Jitsu. 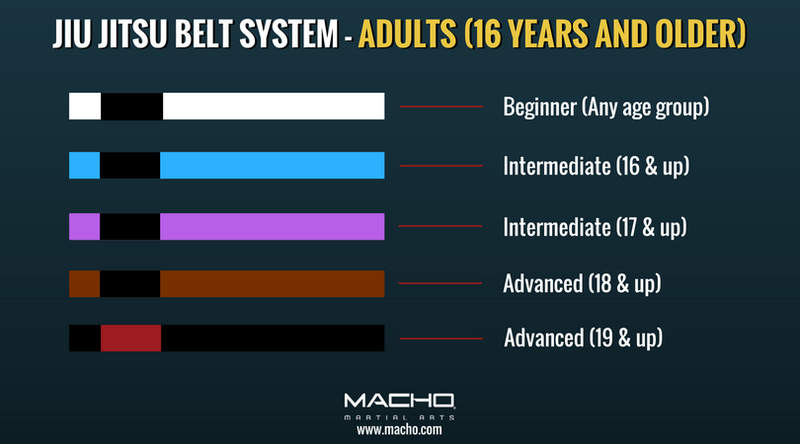 The kids’ belt system has five main belt colors and uses different types of stripes to show how far along in training the student is. These may be awarded to the student for their time, knowledge, behavior, and tournament performance. The order of promotion is as follows: white –> grey/white –> solid grey –> grey/black –> yellow/white –> solid yellow –> yellow/black –> orange/white –> solid orange –> orange/black –> green/white –> solid green –> green/black. The minimum age requirement for each belt rank is based on the year the athlete was born (i.e. ; if an athlete was born in 2002, his or her age is considered 10 for all of 2012). White belts can start at any age, but most schools recommend that children be at least 3 years old or older to begin their training. Only black belts certified by the SJJIF may promote students through the belts listed. 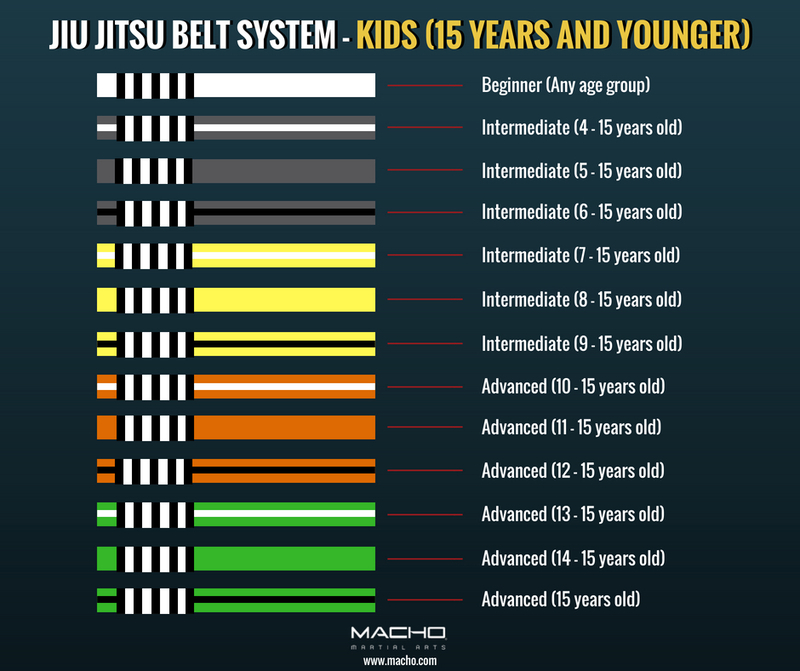 The adult belt ranking system in BJJ is slightly different than for children, although the same premise of belt colors combined with stripes still remains. The order of promotion for adults is: white –> blue –> purple –> brown –> black. In order to be graded a purple belt at 16 years of age, it is required that the athlete has spent at least 2 years as a green belt. In the event where an athlete went from a green belt straight to purple belt, then the minimum time required before he or she can be awarded the brown belt is 2 years. In order to request a black belt certificate, you must be affiliated with the SJJIF. To be awarded a grandmaster belt, you must be a current SJJIF member and listed as the main instructor or assistant instructor at a SJJIF member school. To reach this ranking takes years of experience, hard work, and dedication. To that end, belt integrity is something the SJJIF takes very seriously, as it refers to the accuracy in which an athlete’s belt reflects their skills and knowledge of the art. The SJJIF believes in the importance of all practitioners following the above minimum time in a grade prior to promotion and verifies all members’ belt promotions with their professor in an effort to preserve belt integrity and lineage.